Arrange bread slices in bottom of dish, leaving about 1/2" space on all sides. Combine eggs, milk, salt and pepper in bowl and mix well, set aside. 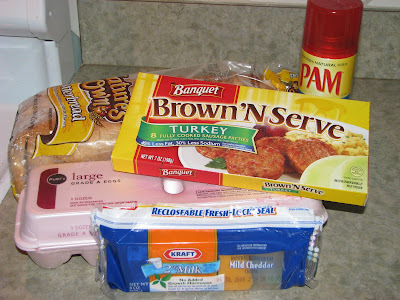 Sprinkle diced sausage evenly over the bread slices. 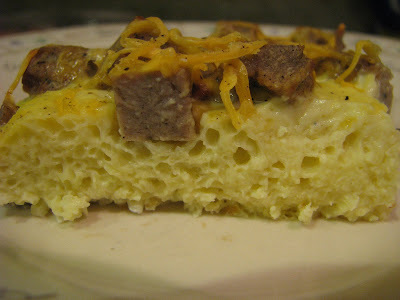 Pour the egg mixture over the sausage and bread. Sprinkle shredded cheese evenly over the top of the dish. In the morning, set oven temperature to 350 degrees F and put casserole in oven. Allow to bake for 25-30 minutes, or until the casserole reads 160 degrees F. Enjoy with your favorite morning beverage and a fruit salad. This one is a little different with the patties. Thanks!